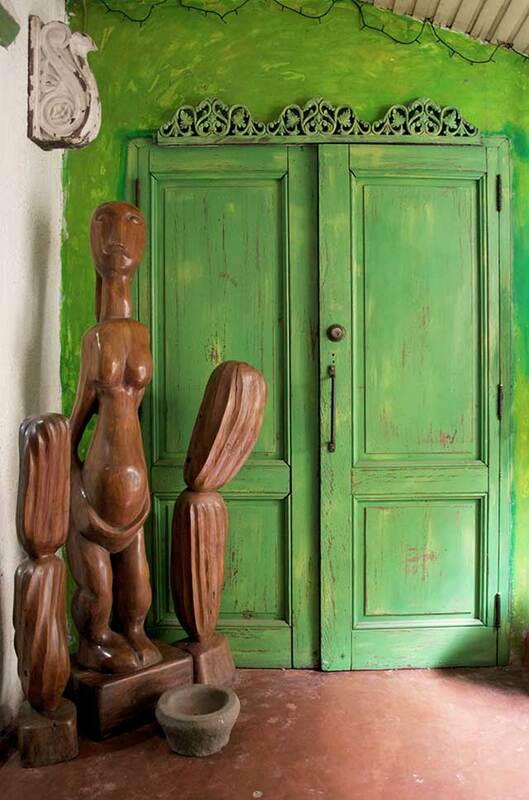 The furniture and décor showroom and gallery Tet & Maggie was borne out of Tet Ureta-Aligaen and Magel Cadapan’s years of friendship and love for creating. It all started with a little nudge from Tet’s late husband, who saw a brewing connection and shared passion between the two. 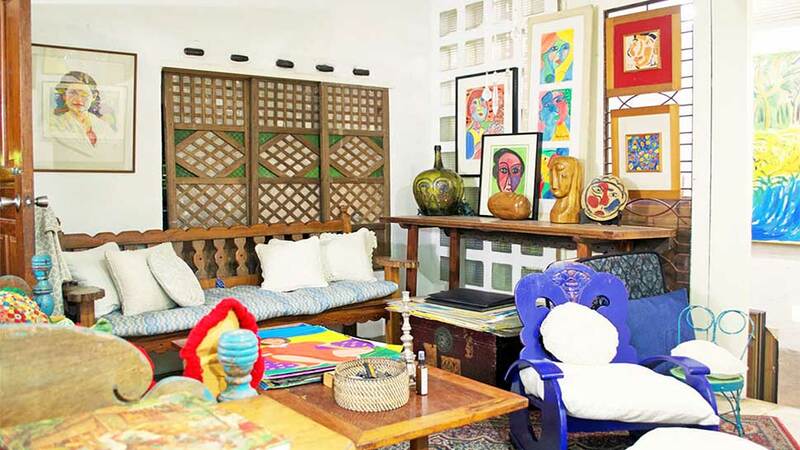 “Alam mo, ang maganda sa inyong [dalawa], magtayo kayo ng gallery,” he said. And true enough, the duo began shopping for fabric, woodworks, ceramics, antique, and everything in between, and got into business. “Everything fell in the right place at the right time,” says Magel of their beginnings. On top of their relationship over personal matters and shared talents, they met skilled artisans in the people in their employ. Their driver—now shop manager—is knowledgeable in materials and can identify the type of wood at a glance. A painter they hired for a job is now one of their carpenters. 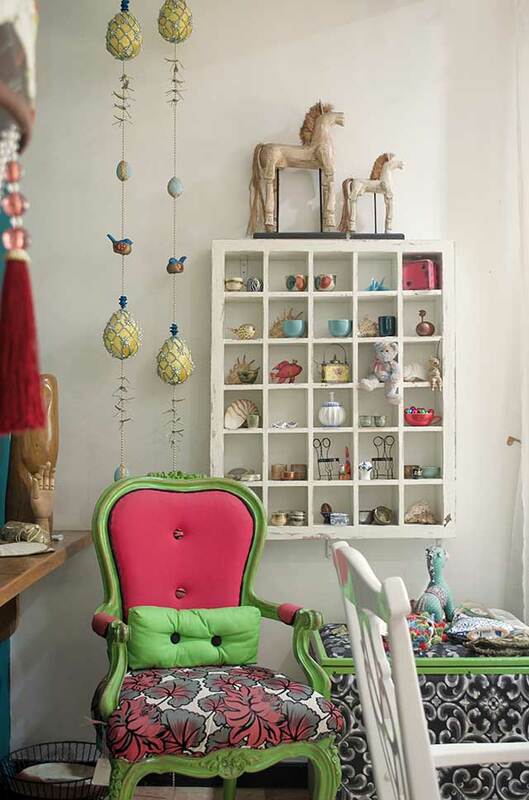 Their happiness translates to their designs, giving life and spirit to old, forlorn furniture pieces, which they reupholstered in electric pinks and teals (above). They have stuffed dolls/pillows in a mish-mash fabrics (below), all hand-sewn and given personalities. 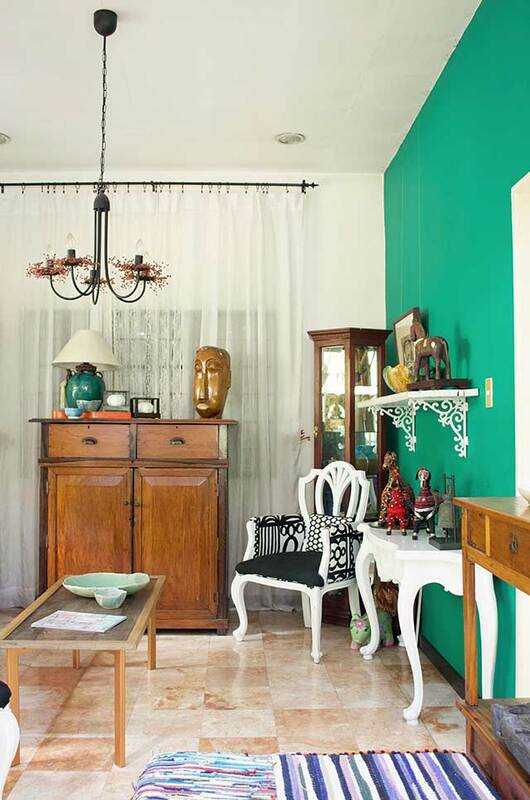 Wooden, as well as ceramic furniture are repainted and refinished in bright colors and decorated with lace, pompoms, and uniquely patterned tiles. They even have a blue-painted and upholstered toilet seat attached with a reading lamp from a golden post. “Nasa garden ‘yan ni Lanelle [Abueva]. Ang sabi ko ay kukunin ko. Ginawa kong may ilaw siya, uupo ka diyan at magbabasa. Toilet humor namin ‘yan eh,” chides Tet. 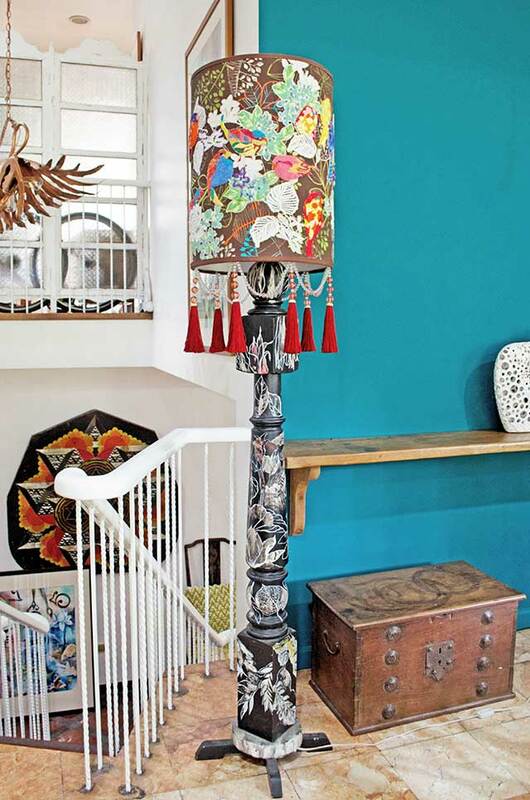 Tet and Maggie’s newest products include tapestries of beautifully patched textiles embroidered and sewn with dragonflies, tropical leaves and birds in patterned skins, lace borders or pompom trims, and finished off with their inimitable crazy you have to see to understand. They also have cylindrical lamps in hardened lace, and lamps in fantastic and tropical themes with crystal beads and tassels (above). 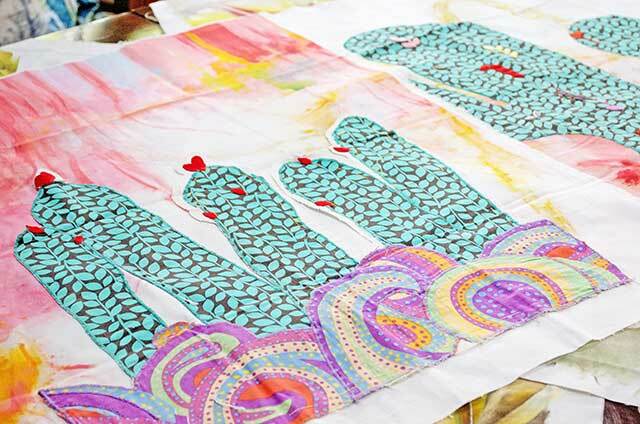 Tet has also began hand-painting floral designs for pillow cases, and a linen line with cactus patches with psychedelic swirls and threadwork. And there’s a café, too! 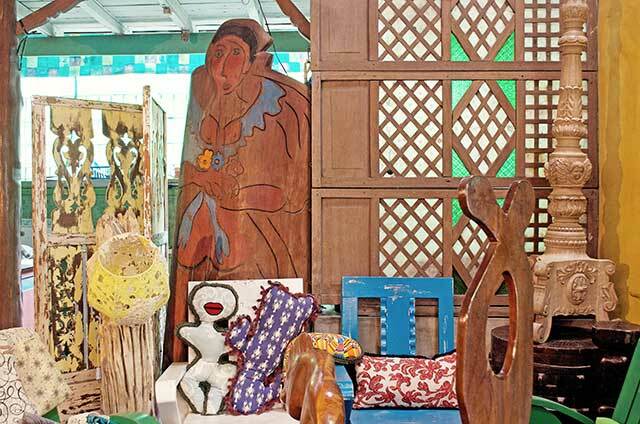 Although their showroom is located in a quiet private village in Antipolo, it is a far cry from their pleasantly over-the-top pieces. 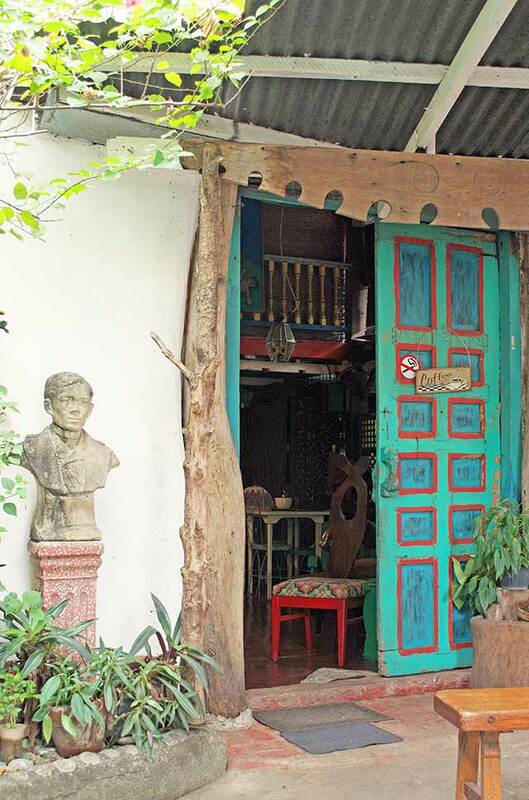 The space is also home to Café Inday, named after Magel’s mother, who still lends her paintings and style to the unique furniture pieces of Tet and Maggie. Their style can be summed up in one simple phrase. Tet offers, “Kapag mag-create ako, kailangan masaya ako.” And although their pieces do not yet have a mass appeal, they are proud of their designs and believe that each one will find a home. “The pieces need a lot of understanding eh. Minsan hindi pa nagre-reveal sa tao ‘yung design,” adds Maggie. 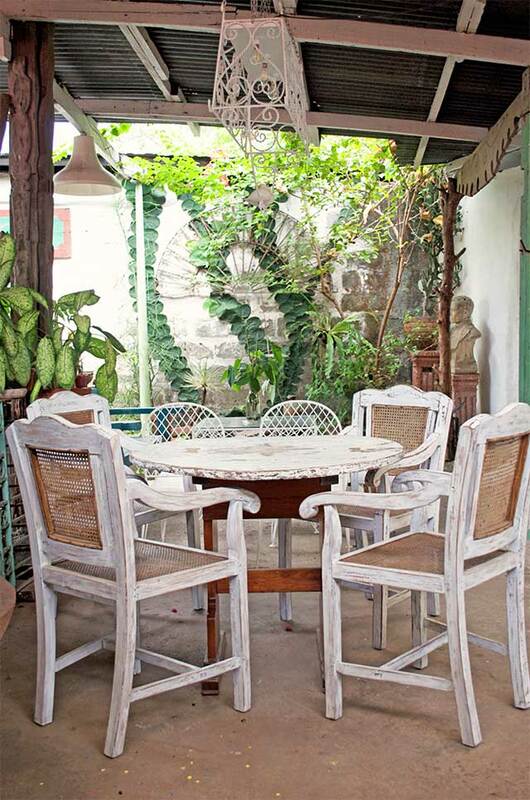 Plan a visit to this reclusive yet vibrant spot for rebirthed antiques and hodgepodge finds and take home a piece of happiness or two. Visit Tet & Maggie at General Luna St., Villa Carmen Subdivision, Antipolo City, tel. (02) 664-9075, mobile 0917-792-9020; or follow them on Instagram @tetandmaggie and on Facebook. Café Inday is by appointments and prior reservations only; call the café at tel. (02) 664-9075 or mobile 0917-792-9020 for details.